Creativity is an extremely useful skill in life because it makes it much easier to solve the problems, we are much more inventive and we increase our creative potential. All activities that require concentration and searching for unconventional or cunning solutions make the level of creativity grow. Although creative thinking develops throughout our lives, it is worth taking care of its development from an early age. 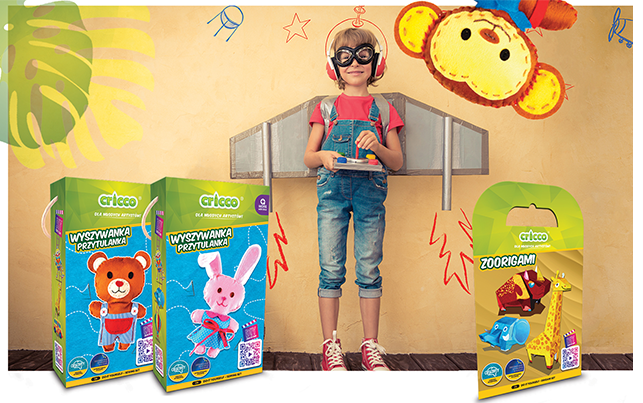 Wanting to support children and encourage them to actively train their skills, we have created with Cricco a new series of “do-it-yourself” products, which – alongside educational values, also provide great fun and joy. The new series of “do-it-yourself” includes, among others, plush cuddly, tissue paper stickers, thermopendants, scratches, and zoorigami. Each product has been designed to contribute as much as possible to the development of manual and creative skills for children aged 5 – 12. Attached instructions help to create each toy in a right way, but many elements of children can do according to their own idea. The “do-it-yourself” series is characterized by an attractive, interesting design adapted to the age of users. Made objects can be used for further play or be a decorative element of the room. Each package is provided with a special QR code that will take you to the creative world of Cricco and show you how to do the toys step by step. Durable cardboard packaging in an eye-catching design attracts attention. To learn more, visit our website www.cricco.pl. We also encourage you to follow our profile on fb.